If we’re going to transform the Richmond region into the most active metropolitan area in the country, it’s going to take an array of initiatives. To reach into every county, to impact every neighborhood, school, and workplace, public health researchers are clear: you need a robust and diverse set of tools working together. The key ingredients? Public infrastructure, targeted policies, effective programming, engaged leaders, and passionate champions. Richmond has many of those elements in place, but we’re still strengthening them. As we focus on each of the improvements we need to make locally to improve the health and quality of life of every area resident through physical activity, what ideas can we adapt from other areas? What lessons can we learn faster and put into play sooner? River City, Meet the Bull City! Durham, NC (the Bull City) provides an excellent counterpoint to Richmond. We’re similar-sized cities with adjacent suburban and rural counties. We share historical hallmarks and demographic profiles. And it’s quick 2.5hour trip down 95/85 for a bus full of Richmond leaders, which is exactly who we took down to Durham. The last key thing Richmond and Durham have in common? Neither of our region’s have “figured it out” just yet. Neither of us are the #1 fittest city in the USA. But neither region is in last place either. We’re both works in progress when it comes to physical activity. And Durham’s progress is instructive for ours. 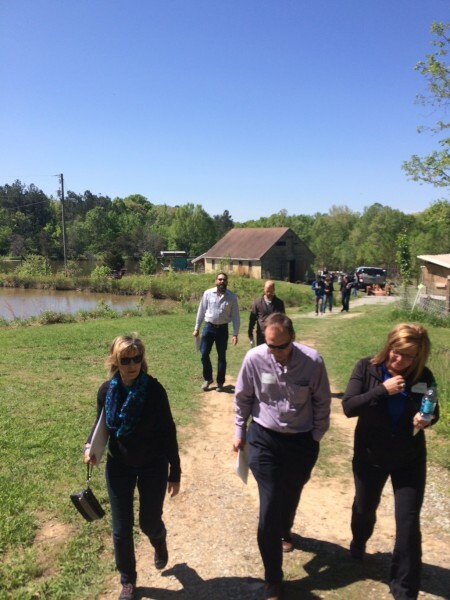 The Durham Public Schools have constructed a 30 acre “Hub Farm” for all the schools in the system to use as an outdoor active classroom. Chesterfield Supervisor Dorothy Jaeckle, Timmons’ Group’s Dave Anderson, and Greater Richmond YMCA’s Tricia Puryear. 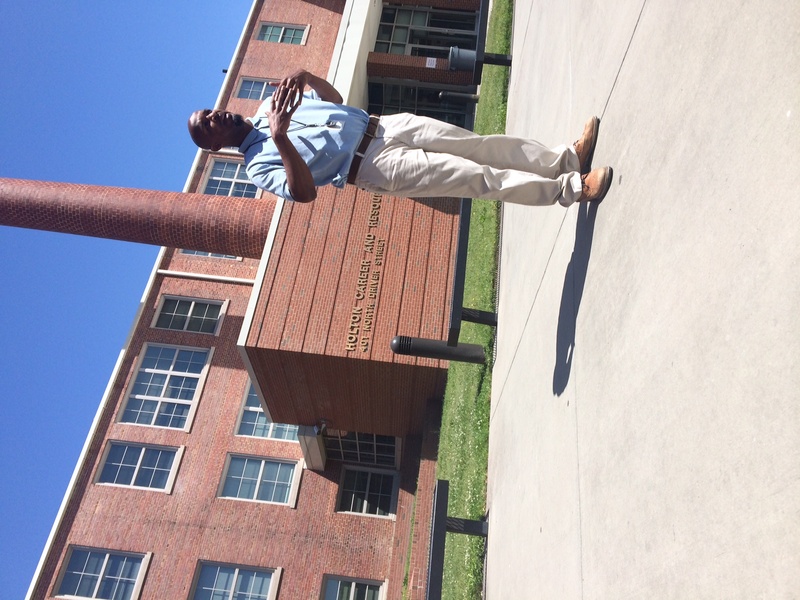 The American Tobacco Campus in downtown Durham has been a catalyst for economic revitalization. The architects, city, and developers prioritized bike and pedestrian infrastructure, open spaces, and public amenities. 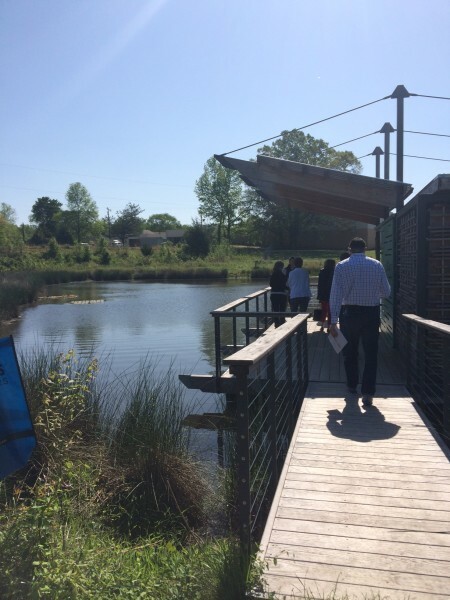 Some of the businesses located in the campus have nearly 100% of their employees walking and biking for their daily commute! 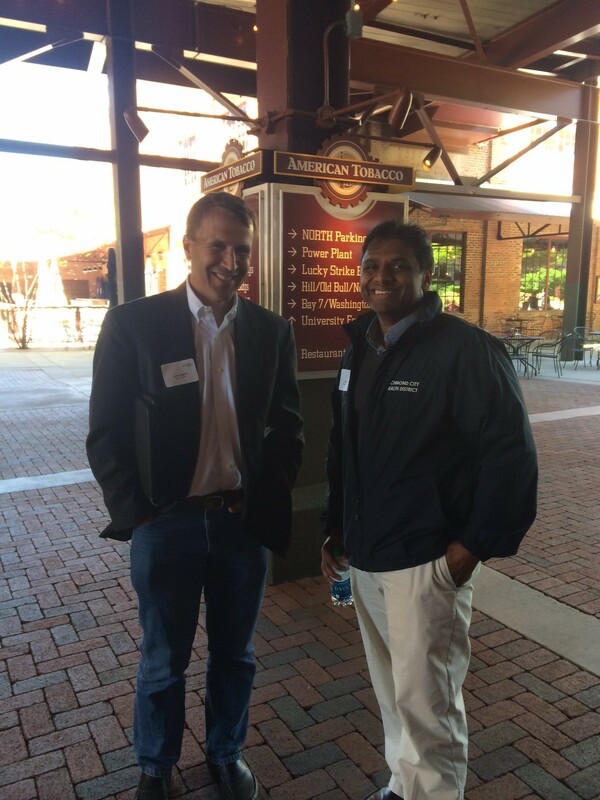 Sports Backers’ Executive Director, Jon Lugbill, and Richmond City Health District Deputy Director, Dr. Danny Avula. 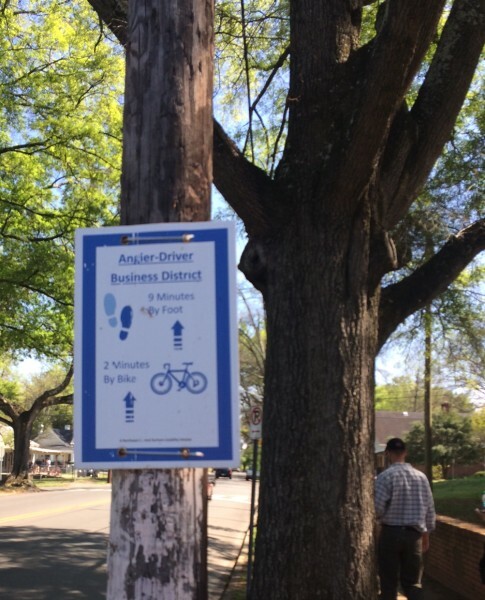 With a little bit of paint and the help of the neighborhood, the Partnership for Healthy Durham has put in 4 “Healthy Mile Trails” with 11 more to come. 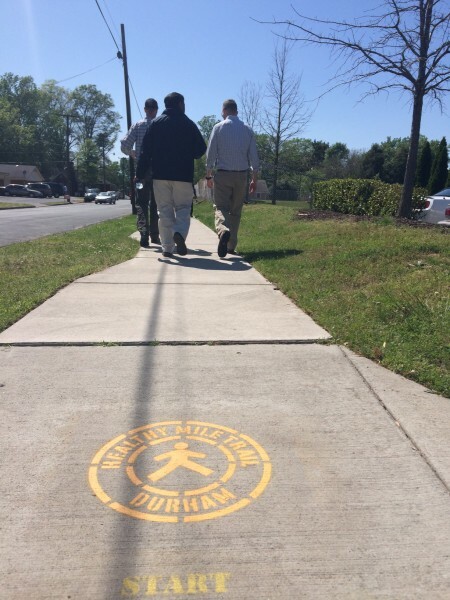 Weekly walking groups have formed around them, sidewalk improvements have taken place, and there’s anecdotal evidence of a reduction in street crime. The wonders of paint and walking! 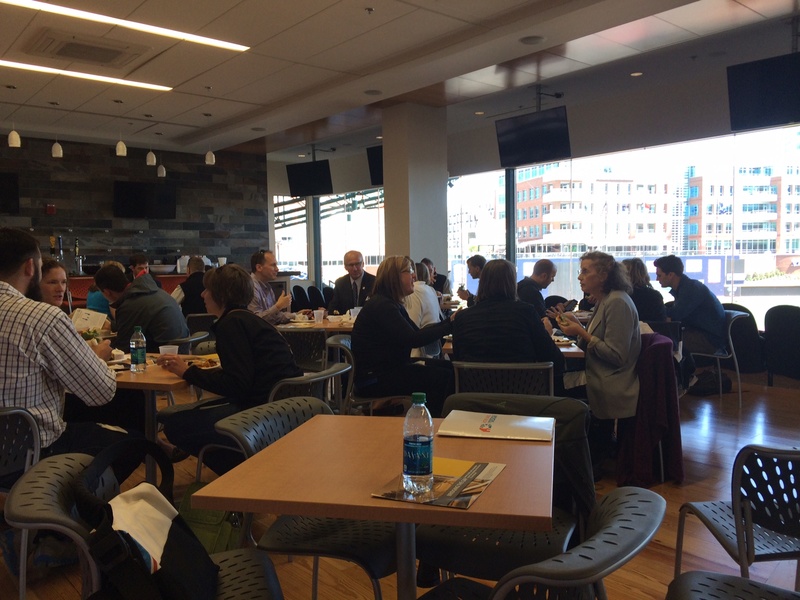 Lunchbreak at the Durham Bulls’ Stadium. Wherever Richmond builds a new ballpark, this one sure was pretty! Wake County Commissioner, Sig Hutchison, has long been a champion for active transportaiton! 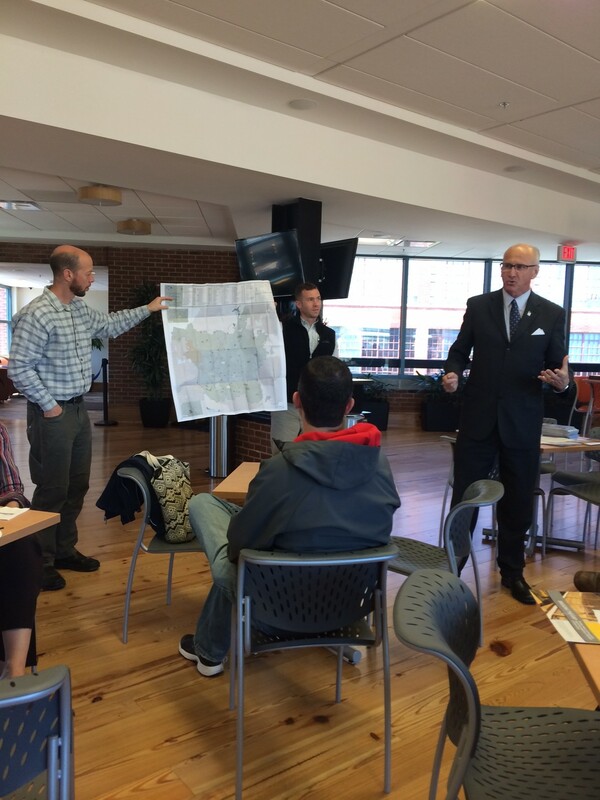 Wake has approximately 100 miles of off-road greenways. The benefits? According to Hutchison property values go up, people connect with their neighbors, commutes get easier, public health improves, and the country reaps all those benefits! 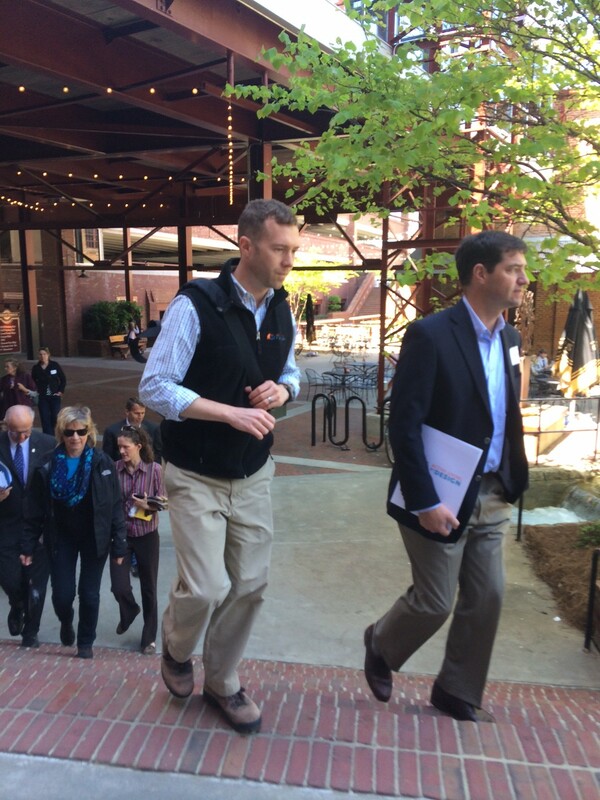 Tim Schwantes of Active Living by Design (ALBD) with Sports Backers’ Board Chair and Merrill Lynch leader Tyler Hutchens. ALBD champions proven strategies for building active communities and helped organize the Richmond-Durham visit. 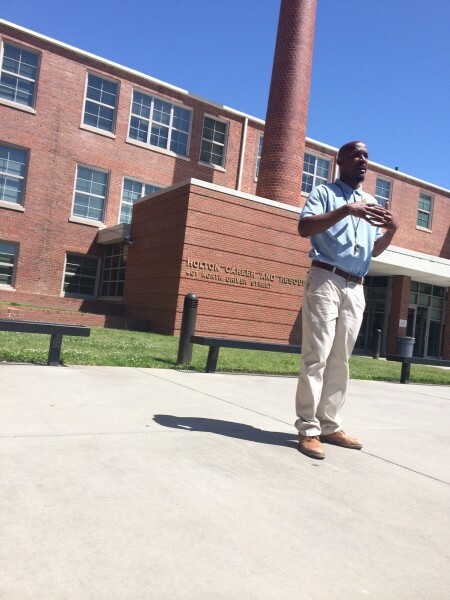 To shorten the distance between residents’ issues and residents’ solutions, Durham has a network of “Engagement Coordinators” like Nick Allen at the Holton Resource Center, a converted public school. Nick works on public health, sidewalk improvements, public safety and other issues that impact his residents’ accessibility and interest in physical activity. 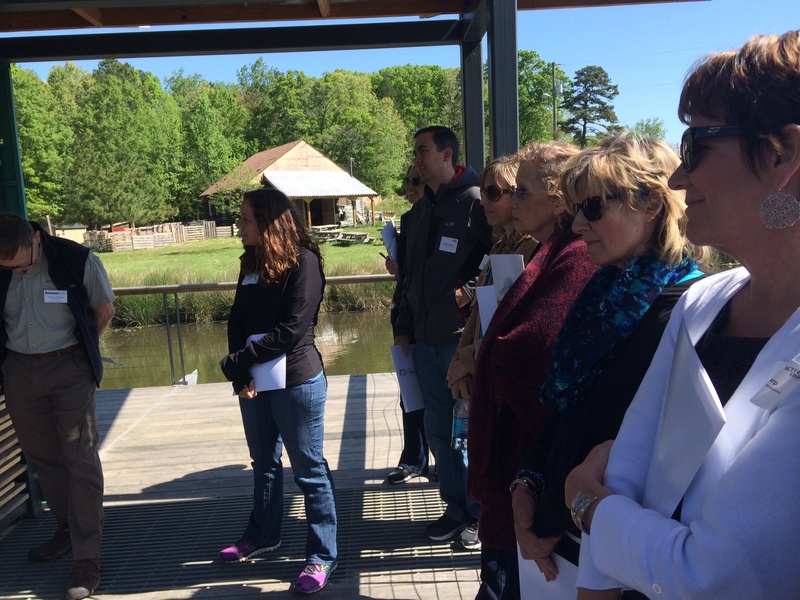 Foundation, government, nonprofit, and business leaders had a sunny day to explore Durham’s experiments and successes in active living infrastructure. To encourage and celebrate the simple act of WALKING from point to point, these “guerrilla signs” were produced cheaply and installed casually around a residential area in Durham.